The Potters of the Blue Ridge members were all smiles as they prepped for the Teapot Challenge on a recent evening at Doe Ridge Pottery below King Street. The Teapot Challenge is a recurring benefit for the annual Empty Bowls event at Watauga High School, which takes place on Saturday, March 19. About 10 local potters gathered in the downtown Boone pottery shop and exchanged handcrafted teapot parts. All the potters crafted the individual parts, and then the members randomly selected the various parts, such as the handle, spout, body and lid, to form a unique teapot. Basically, the only rule is that no one is allowed to use a part they made for their finished, charity teapot. “It sort of an exercise in trying to get people out of their comfort zone when making things,” Doe Ridge Pottery owner Bob Meier said prior to the event. Potters of the Blue Ridge isn’t exactly a new organization, but Meier said it’s definitely been rejuvenated in the past several months with new activity. Among the initial projects it wanted to participate with as a group is Empty Bowls. “Most of the members already participate in Empty Bowls and think it’s such a good thing,” Meier said, adding that Doe Ridge Pottery has been making and donating bowls for the WHS event since Whit Whitaker started the event 15 years ago. Meier also donates to similar events in surrounding counties. For about a decade, the Teapot Challenge was undertaken by local potters under the auspices of the Patricelli Craft Enrichment Program at ASU. It was initiated by Lucy Hamilton’s intermediate ceramics class, and the completed teapots were donated for silent auction at the local Empty Bowls event. “Over the years, the challenge has taken on a life of its own, becoming a premiere event for Empty Bowls. Many dedicated collectors return year after year to add to their teapot collection, while making a generous donation at the same time,” potter Nancy Graham wrote in an email to Potters of the Blue Ridge members announcing the 2016 challenge. After the potters are finished building their teapots, the members will meet back at Doe Ridge Pottery on March 9. The teapots will then be displayed for sometime in the window at Doe Ridge Pottery until being moved to the high school for the Empty Bowls event, which takes place on Saturday, March 19. Empty Bowls concept began in 1990 when a high school art teacher in Michigan was looking for ways to raise funds to support a food drive. The students made ceramic bowls for the project and guests were served a simple meal of bread and soup. Since that first Empty Bowls supper, millions of dollars have been raised to fight hunger. The event has raised almost $100,000 for the Hunger and Health Coalition. 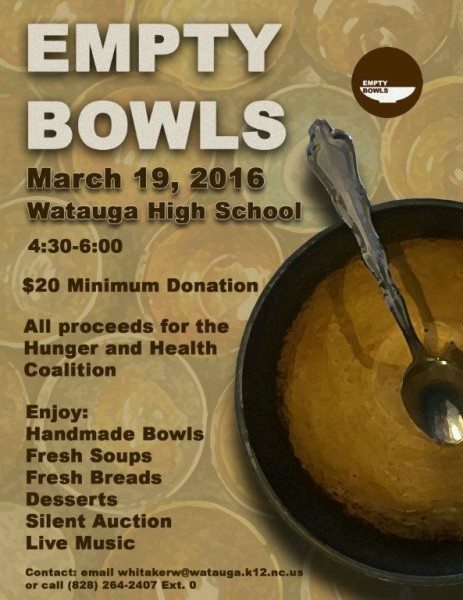 The local Empty Bowls event takes place on Saturday, March 19 at Watauga High School from 4:30 to 6 p.m. Minimum donation is $20, and all proceeds go to the Hunger and Health Coalition. Enjoy fresh soups, breads and desserts and take a handmade bowl home. Live music and a silent auction will add to the festivities on Saturday. For more information, email [email protected] or call 828-264-2407, ext. 0.